If buffalo wings could be made into soup form, this is it! Open the cans of diced tomatoes and tomato sauce. Open, drain, and rinse the black beans. 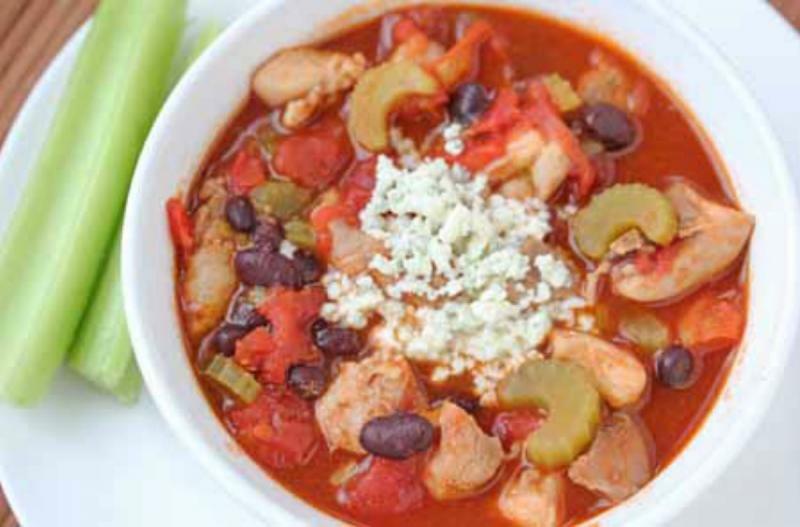 In a large saucepan, add the diced chicken, chopped celery, black beans, diced tomatoes, tomato sauce, chicken broth, hot sauce, and minced garlic. Bring to bubbling, then reduce heat and cover. Cook for 5 to 10 minutes, or until chicken has cooked through. Season with salt and pepper to taste. Ladle into serving bowls and add pinch of crumbled blue cheese to each bowl. Add more hot sauce to taste. 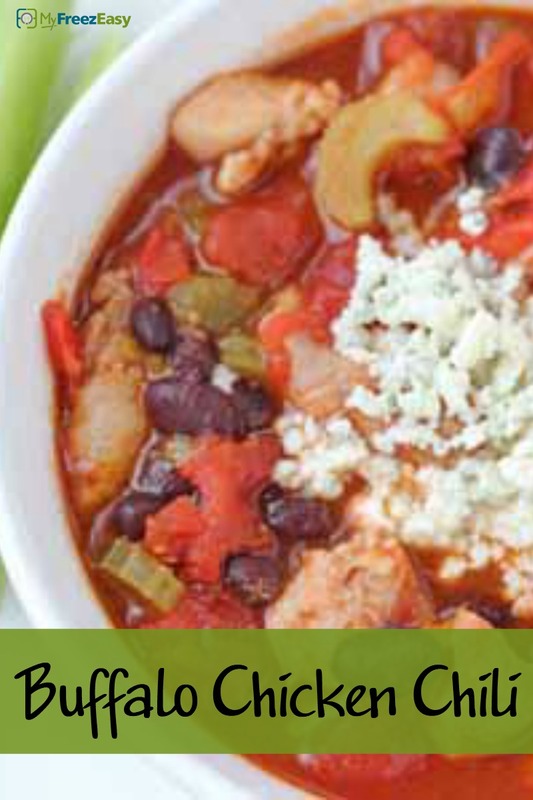 Serve Buffalo Chicken Chili with salad and dinner rolls. Cut the 4 chicken breasts into bite-size pieces. Open the 2 cans of diced tomatoes and 2 cans of tomato sauce. Open, drain, and rinse 2 cans of black beans. Put baggie in the freezer and freeze up to 6 months in fridge freezer or 12 months in a deep freezer. Thaw in the fridge overnight, or a warm bowl of water for about 20 minutes, before transferring all of the contents of the baggie into large saucepan or Dutch oven. Bring to bubbling and cook for 20 minutes, or until chicken is cooked through. Omit the blue cheese garnish for dairy-free meal. Thaw and add contents of baggie to large saucepan or Dutch oven. Bring to bubbling and cook for 20 minutes, or until chicken is cooked through.